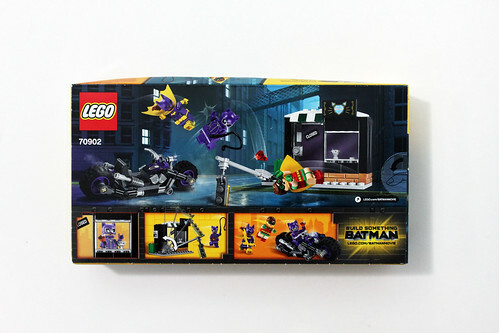 One of the smaller sets for the initial wave of The LEGO Batman Movie set is the Catwoman Catcycle Chase (70902). It consists of only 139 pieces and retails for $19.99. 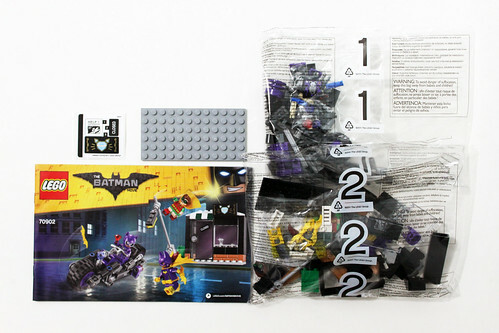 The contents of the box include two numbered bags, loose 6×12 gray plate, a small sticker sheet, and the instructions. 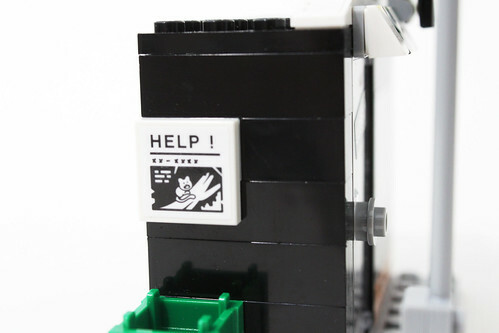 For a fairly small set, it’s surprising to see three minifigures included. First is Batgirl. 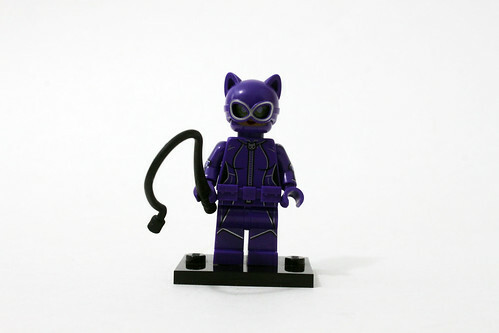 She is the same minifigure that is in The Joker Notorious Lowrider (70906). She has a purple and yellow outfit that is detailed on both sides of the torso, legs, as well as on the sides of the legs for the boots. She also has one of the new utility belt pieces that Batman has. The cape that Batgirl wears is a newer one that has a sheen on one side. She has a double-sided head with a normal expression on one side and an angry look on the other. 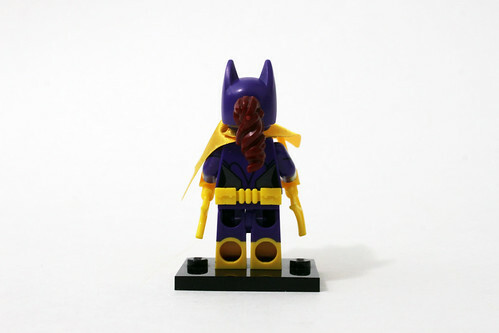 The cowl piece is a new one with a peg in the back for her ponytail hair piece. Her accessories are a couple of yellow Batarangs. 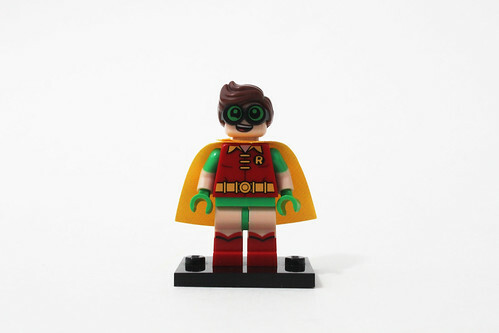 Robin is one of the newer minifigures that I haven’t reviewed yet. 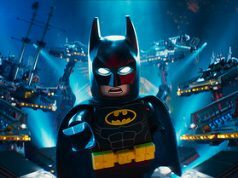 He wears his signature red, green, and yellow outfit which the trailer explains Batman naming it the Reggae Man suit. 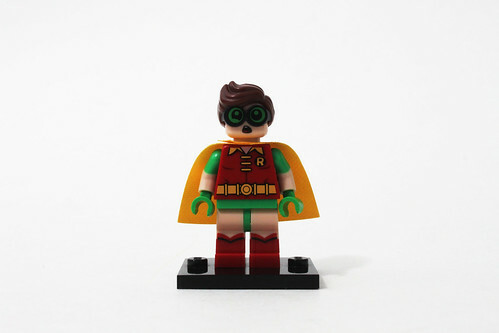 The torso has printing for his yellow belt and the Robin logo. 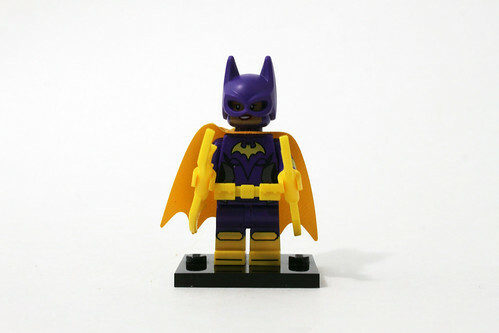 He has a shorter yellow cape that has the same sheen as Batgirl. The legs piece show off his bare legs with red boots as he ripped the pants off. Robin also has a double-sided head with a very happy expression on one side and a sort of a confused look on the other. The hairpiece is also combined with his large glasses which will make for some interesting minifigure creations. 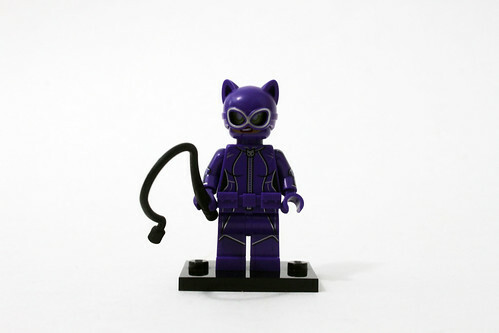 Finally, we have Catwoman who dons a new outfit. 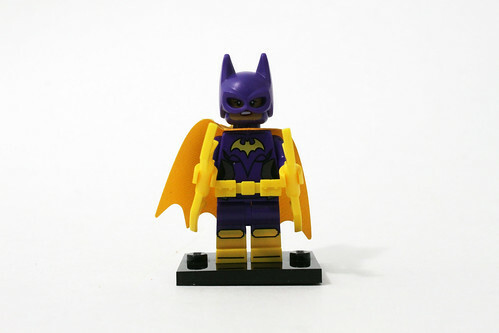 In The LEGO Batman Movie, she wears a purple outfit which also inclues a purple utility belt piece as well. Her suit has a zipper that goes down the torso with a cat at the top. The arms also has some printing of the suit for her elbowpads. The back is very detailed and it seems to appear to be some armor. She has a double-sided head with a normal look on one side and an angry look on the other. There’s also printing of her green goggles as well. The helmet that she wears has a very cat-like appearance with some molding for the goggles. Her accessory is her signature whip. 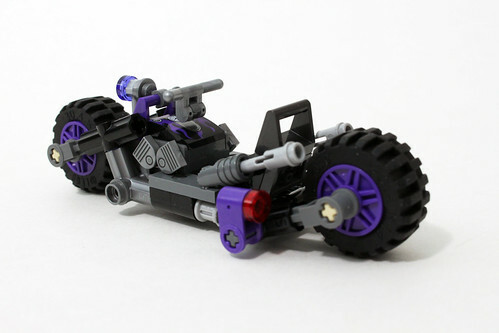 The first part of the build is the Catwoman’s Catcycle which has the more recently used lowrider style of bikes that’s been used in some Nexo Knights sets as well as the Spider-Man: Ghost Rider Team-up (76058). 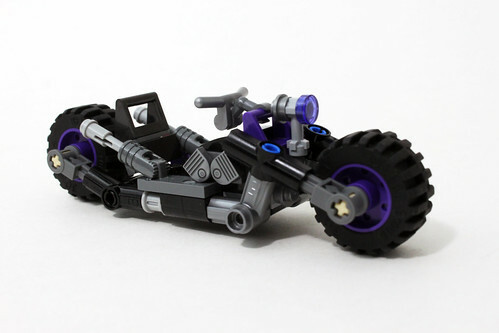 The bike chassis is built starting from just a 2×4 plate and uses a lot of Technic parts to give the overall look of it. 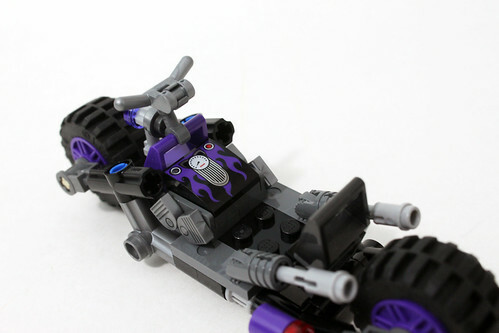 Towards the back, there are a couple of Technic Pin 1/2 with 2L Bar Extension used as the Catcycle’s exhaust. 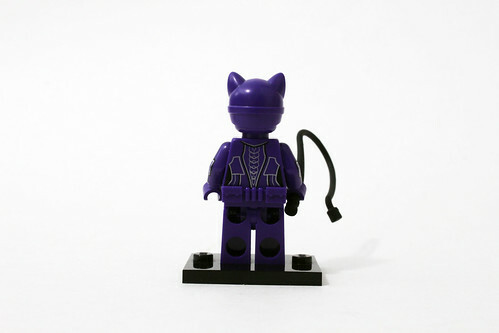 There is some purple parts scatterer throughout to distinguish that it’s Catwoman’s vehicle such as the wheels, the printed sloped dash, and the rear brake light. The dash has some details for the speedometer with some cat ears and some purple flames. Some more printed pieces include the metallic silver curved tiles which represent the engine’s cylinder heads. 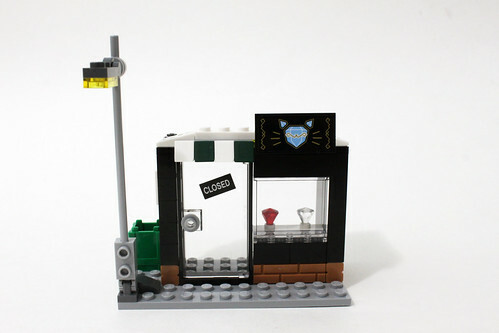 The other part of the build is a small jewelry store with a sidewalk. The bottom layer of the store is made out of some nougat masonry bricks. Over the the door is a small awning using some white and dark green cheese slopes. Above the window is a store sign that uses a sticker. 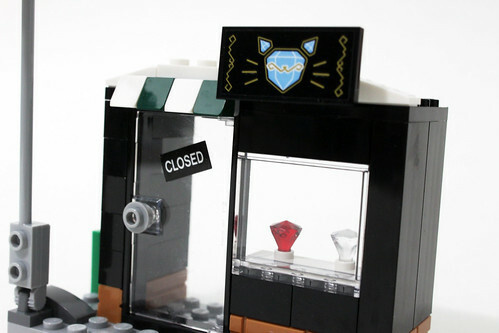 Notice that the sign logo shows some diamonds shaped as a cat. On the alley side of the store, there’s a green trash can and above that is a missing cat poster that’s also a sticker. 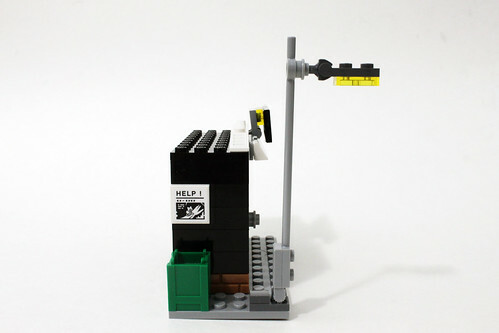 Finally, on the corner of the jewelry store is a lamppost on a hinge. 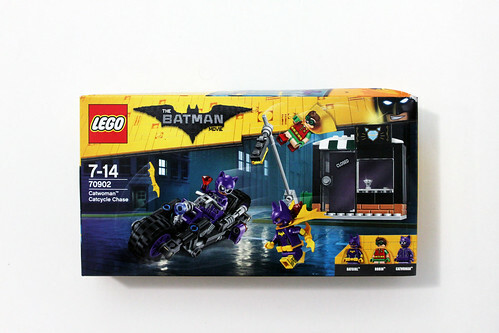 Overall, The LEGO Batman Movie Catwoman Catcycle Chase (70902) is a fairly underwhelming set. 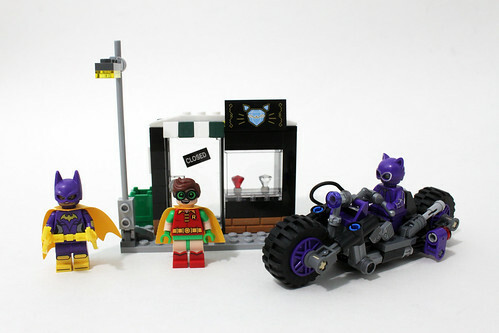 The three minifigures are the main draw for me since Catwoman is exclusive to this set while this is the cheapest way to get Batgirl and Robin in their respective outfits. 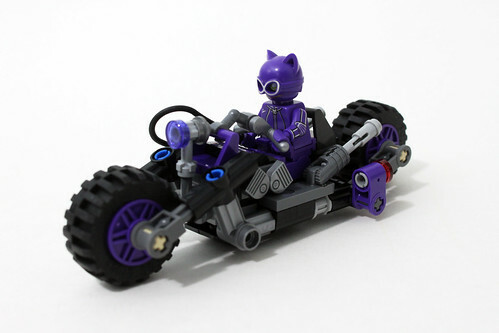 The Catcycle itself is pretty small but the build is welcomed considering that Catwoman is usually packaged in cycle sets that have the molded piece that goes over the chassis. 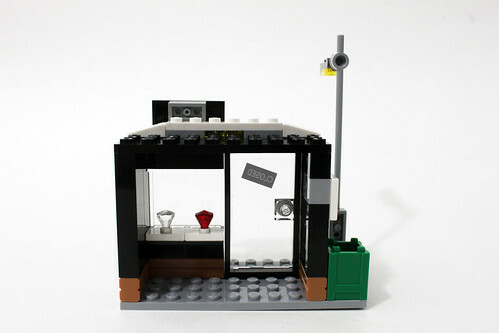 The jewelry store also is somewhat a little disappointing but they fit well into some of the other smaller sets that have buildings.